Deciding to study nursing in Canada can play a prominent role in your journey towards building a global nursing career. Not to forget your choice of college and city can make all the difference. 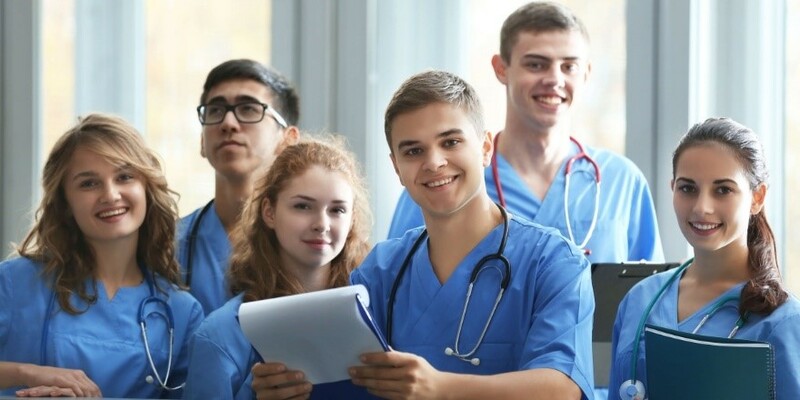 If you decide to study nursing programs in Toronto then it is highly likely that you’ll have a wide variety of specialized nursing programs to choose from. Further, you can read in depth about the type of nursing programs you must study in Toronto and why they could be the right choice for you. With education comes power to change the world. This is a lifelong lesson that stays with most of us, forever. As quoted by Leonardo da Vinci, “learning never exhausts the mind”, there is nothing better for the mind than the perspective of learning more and feeding your neurons with new material. Well, the thought above implies to almost all the professional fields, but in its complete sense it sounds perfect for nurses. Once qualified, nurses must continue their education in order to stay updated about the medical advancements happening around. To make a difference in patient’s quality of life, it is important to keep a steady knowledge about the ever-evolving field of healthcare. Moving on from the importance of education for nurses, we must also know about the nursing programs to study in order to advance your nursing career on a global level. To begin with, you must understand the importance of studying nursing abroad. Moving out of your home country and studying nursing in foreign locations helps to broaden your perspective about the varying methods involved in patient-care. 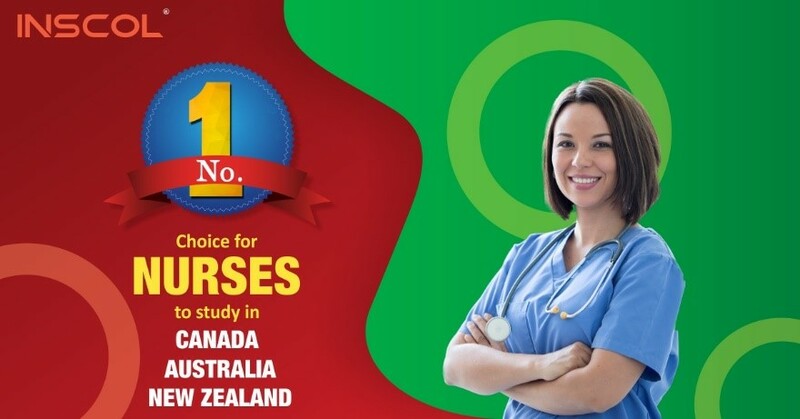 Nowadays, a majority of Internationally Educated Nurses (IENs) are choosing Canada to continue their nursing education. The country offers a liberal environment where you can create your unique learning experiences. With a strong emphasis on the need of practical learning, nursing programs in Canada help you to match up the skill set required to be a part of the Canadian healthcare system. Being an immigrant friendly country, Canada also has certain regions that are more preferable when it comes to nursing education. One of these regions include the city of Toronto. Studying nursing programs in Toronto can be life changing for you in more than one ways. However, you must pay sincere attention to what program you want to study, what will be its future outcomes and how well is it aligning with your academic history. Below we have elaborated on a few nursing programs that can be the right choice for you. 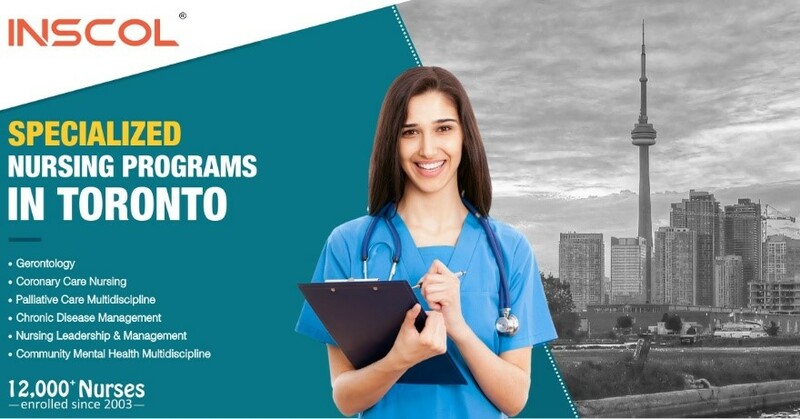 International students can find a variety of nursing programs in Toronto and not to forget, the choice of your study program reflects highly in your future career prospects. Hence, it is important to choose carefully what you plan to study. 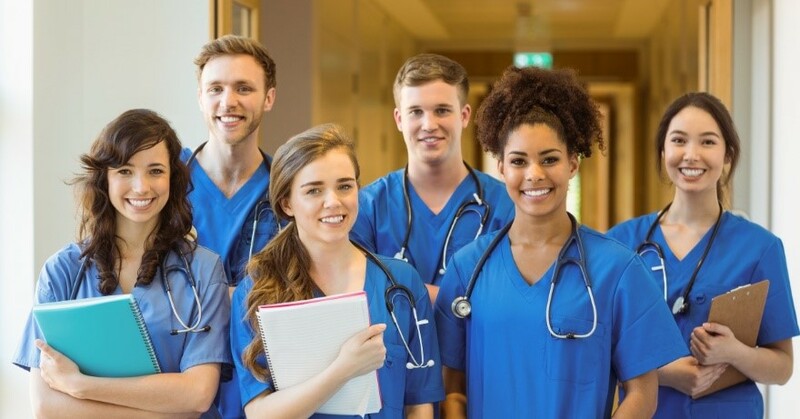 Nurses, when considering studying nursing programs in Toronto, it is highly recommended to go for specialization programs that help you to hone your skills in a particular nursing discipline. Nursing has a vast array of specialties and each of these has a varying demand in different countries and different regions. Considering Toronto, here we have mentioned six nursing specialties along with the factors that make them a wise choice for you. With the evolution of healthcare, Gerontology is now central to development of a country. Developed nations like Canada identify the potential of this nursing discipline and its impact on improving the quality of life for the aging demographic. The standalone discipline defines the core values, knowledge and the essential clinical skills required to enhance the health & well-being of the aging population. Over the years, Gerontology has gained importance facilitating physical and mental assistance to an ever-increasing elderly population. There’s so much more that this branch of nursing encompasses other than assisting and treating old people. Studying Gerontology provides you the knowledge, understanding and expertise required to curate patient plans varying as per the different behavioral patterns of old patients. With the increase in the ageing population of Canada, studying this specialization can offer hybrid career opportunities for you. Coronary care nursing also known as cardiac care nursing is a specialization dedicated towards treating patients with cardiovascular illnesses. Nurses planning to hone their skills in the cardiac niche can specialize to be coronary care nurses. Studying this specialization in Toronto can be beneficial as you get an exposure to evidence based practice, which prepares you for the upcoming patients in your professional journey. Becoming a coronary care nurse requires advanced training and clinical expertise. You must realize that there will be patients dealing with diverse cardiac disorders and each of them would need you to curate suitable care plans. Considering on a global front also, the specialization of coronary care has a high demand due to the ever-increasing population of heart patients. It is an interdisciplinary approach aimed towards caring for people with life-limiting illnesses. This specialization focuses on creating an environment of recovery from physical pain and mental stress at any stage of illness. A palliative care nurse must closely assess the needs of the patient and family on a psychosocial, physical, and spiritual level. The job responsibilities also include preparing patients and families for the end of life transition. Studying a palliative care nursing program in Toronto exposes you to cultural diversity, casting light upon the varying standards of patient care in Canada. Disease management programs are gaining popularity in Canada, creating more employment opportunities for nurses. Specializing as chronic disease management nurse also adds value to the healthcare system, as there’s a development of team of professionals educating patients to help them manage their chronic diseases. Studying a nursing program in this discipline might also lead you towards becoming a Registered Nurse (RN) in this specialization. RNs catering to chronic disease management have to take charge of the complex care requirements of the patients. With constant research and practice, they must work towards improving patient outcomes. In the profession of nursing, leadership qualities are of utmost importance. The modern era perceives nurses working at all levels as natural leaders. Even though there’s always a scope for leadership skills to develop organically, a lot of benefit can be reaped by acquiring concentrated knowledge about nursing leadership and management. Studying a leadership and management nursing program in Toronto can open a gateway of opportunities towards acquiring leadership roles within the Canadian healthcare settings. Nursing leaders may help in designing and implementing patient care policies. They may also educate their coworkers through extended training programs. Trusting the facts of Canadian Mental Health Association, in any given year, 1 in 5 people in Canada personally experience a mental health problem or illness. Thus, the alarming frequency of mental health patients in the country has led to a rising demand of mental health nurses. 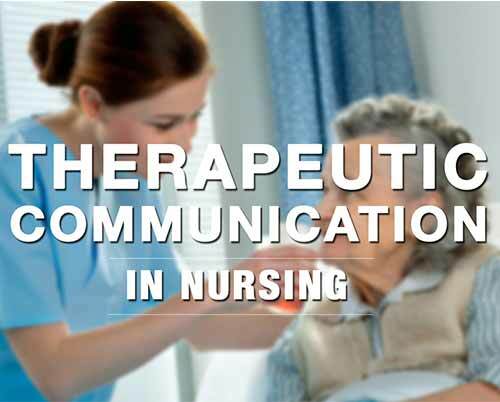 Nurses specializing in community mental health must build strong therapeutic communication skills, as it is a foundation of building a cordial relationship with the patients and their families. You must understand that every patient with mental illness will show a different level of sensitivity. Such varying levels will demand you to curate patient care plans by working closely with a group of healthcare professionals. In Toronto, you can find suitable nursing programs that will not only educate you with the theoretical knowledge but also provide you with the opportunities to create practical experiences of treating patients. 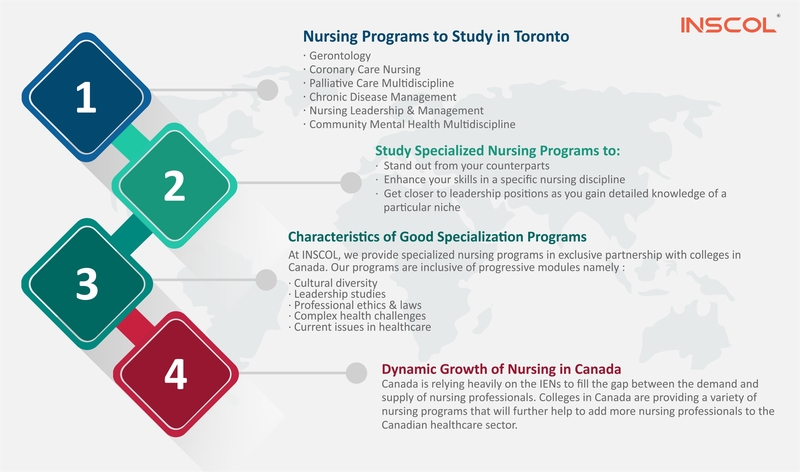 Why Study Specialized Nursing Programs in Toronto? Nurses, in order to stand out from your counterparts, you must enhance your skills in a specific nursing discipline. Specializing also helps you get closer to leadership positions as you gain detailed knowledge of a particular niche. Often the idea of specializing is driven by flashy expectations of earning better. Well, the expectation should not only be to earn better but also to acquire new skills that can lead to a broad career pathway. Acquiring and rebuilding skills is always an ongoing process for nursing professionals. Hence, the idea of studying specialized nursing programs in Toronto seems more appealing. Not only the city offers promising study options but also the diverse culture prepares you for a rewarding global nursing career. To ensure you choose the appropriate specialization, ask yourself these 5 questions before deciding. Which age group of patients do you feel the most comfortable around? How frequently you to cope with stress and trauma situations? Which is the most likable part of your job? What kind of a place would you feel most comfortable working in? What makes you feel most fulfilled about being a nurse? Once you have self-justified the answers to these questions, you might have a better clarity about the specializations you can consider to pursue further. You might have been told that being a nurse is always more than taking good physical care of the patients. Well, it’s time to recall various other aspects that make you a good and competitive professional. Every specialized program will have a focused curriculum yet you must look for a few common parameters that help to achieve your developmental goals. With these modules being a part of our study programs, we ensure a holistic development of your skills to prepare you better for global opportunities. The idea is to promote overall development of Internationally Educated Nurses (IENs) like you seeking a lasting and thriving career. For over a decade now, nurses make up the largest number of healthcare providers worldwide. The most important factor contributing to the increasing number of active nursing professionals is the rise in demand for specialist nursing services. In countries like Canada, the need for specialized nurses is evident from the rising graphs of the ageing population and retiring workforce. These conditions have further led to a ray of scope for Internationally Educated Nurses (IENs) seeking global career opportunities. Canada is relying heavily on the IENs to fill the gap between the demand and supply of nursing professionals. Colleges in Canada are providing a variety of nursing programs that will further help to add more nursing professionals to the Canadian healthcare sector. Nurses, continuing your education is key to progressive career shifts. Hence, never underestimate the value of studying nursing abroad. Well, at the same time you must also realize the value of having a good mentor that helps you pick the suitable country and study programs. The path towards your dream career can be daunting but with undeterred dedication, you shall seek what you’re looking for. At INSCOL, we believe in making your dreams come true and this is what makes us the leader of the industry. You have the power to get there, and now you have the tools to get started. Are you ready?